Today we are competing in the Tour of the South, Coed 80/20 Division of the 100 of Nowhere Bike Race. We are shoo-ins to win. The 100 Miles of Nowhere Bike Race is an honor system ride on a self-defined course. The sillier, the better. Divisions are also self-declared. This is why we are shoo-ins. Provided we finish. Eventually. Given the rigorous nature of the race administration, we decided that it was in completely in keeping with the rules to split the miles between us. Husband has done 100-mile rides. Wife could not do 100 miles downhill with a following wind. Therefore, Wife will drag herself through four laps of 5 miles. Husband will cover the rest. Yes, he is 4 times the biker I am. Easily. We are basing our loops out of the house. We predict the hardest part will be heaving our sorry carcasses of the couch for the the 4th time. The horses, already on break from my numerous saddle seat lessons this week, will snicker from the sidelines as we bike up & down the driveway. No one foresees heavy barn work tomorrow. 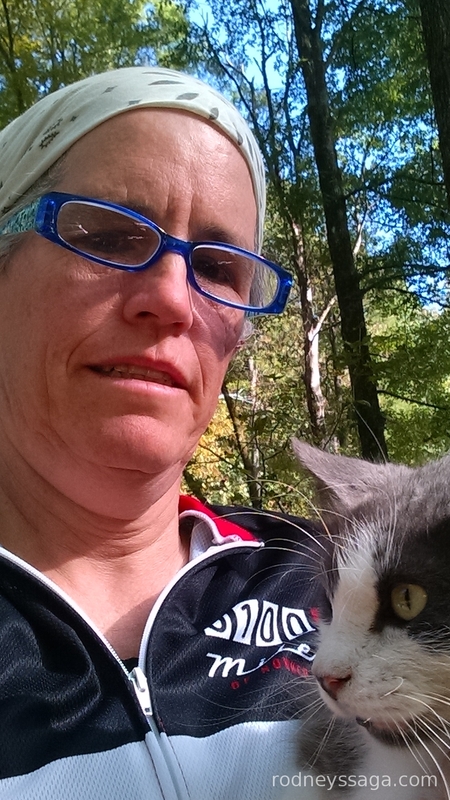 Gratuitous finish line selfie with a purring but uninterested fan, who did absolutely no miles today. 7:38, I’m here! Can’t be here all day, but I can promise to check in. Good luck!! Good Luck! If action banishes fear, you should be fearless by now! Better you than me, girl! Does your bike have a handlebar basket? If so, then I expect to see some gratuitous hitchhiker kitty pics! If you carry a kitty in your basket, you could count each mile as two, one for each participant. Go for it! And best wishes both of you. Bike, bike faster! The faster you ride, the sooner it will be over! OTOH, if you take time to breathe, you won’t be so wiped out when you hit 100.